I have to write a bit about my fathers father... "Grandpa Sid". He was a World War I veteran, he lost his right leg, I think at the hip to a grenade. 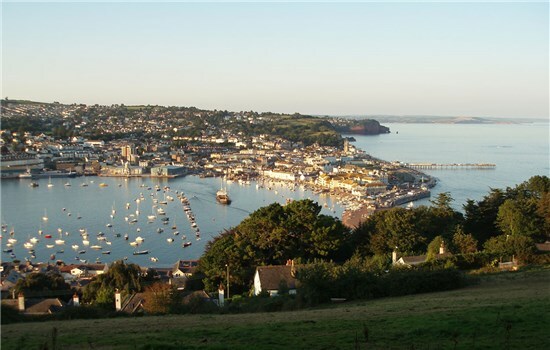 He lived in Teignmouth, Devon, England, on the South coast of England, a beautiful commercial and holiday village. One of my earliest recollections of him and his wife Daisy, she died when I was very young and I only remember a couple of things about her. She was a large lady and I used to go out in Grandpa Sid's dinghy and catch mackerel which she would clean and we would have for breakfast. A real treat. One of my constant recollections of Grandpa Sid was going into his bedroom as a very young boy and seeing his tin leg standing there in the corner all by itself. It used to scare the crap out of me when I saw that thing leaning up against the wall. As the entire leg was made of tin in creaked and moaned constantly, especially the knee joint for which I seem to remember that he carried a small oil can around with him so he could oil his knee. Grandpa Sid's wife, her name was Daisy (thanks sis fro the correction), maybe not, passed on when I was only 4-5 years old. Grandpa was very lonely after loosing his wife. His sons, my father and his two brothers that after 2-3 years of morning was enough they sent him on a cruise to the Mediterranean sea. Well if you send someone on a singles cruises do not be surprised if they are not single on their return... as was th case with Grandpa Sid... he was in his mid 60's and returned with a wife barely half his age. They were married by the ships cleric. Teignmouth is actually know for other famous historical events. It was one of the ports in the 1969 very first Single Handed Round the World Races. Not for that alone but the fact that the sailor who left from Teignmouth never actually sailed round the world. He expertly sailed in circles in the Atlantic but reported his position accurately to the race committee, he also faked the signal strength from his radio and faked his speed, distance and every other intimate detail of the trip and never being more than about 300 miles from England. He stayed out of the shipping lanes again not to be seen or reported. How do we know this you ask, simple after a year of lying he got the guilt's when he was within sight of Teignmouth and sent a quick message asking his wife to forgive him and he jumped over board with his compass never to be seen again.